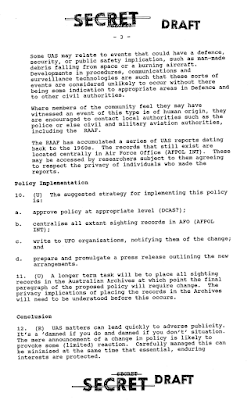 After months of too’ing and fro’ing, I have successfully had the Australian Department of Defence (DOD) declassify and release never-before-seen UFO policy material, and a significant fraction of it is very interesting, to say the least. The RAAF in future will investigate fully only those Unusual Aerial Sightings (UAS) which suggest a defence or national security implication. The Minister for Defence, Mr Gordon Scholes, said today that while the RAAF would continue to be the first point of contact, UAS reports not considered to have a defence or security implication would not be further investigated. For many years the RAAF has been formally responsible for handling Unusual Aerial Sightings (UAS) at the official level. 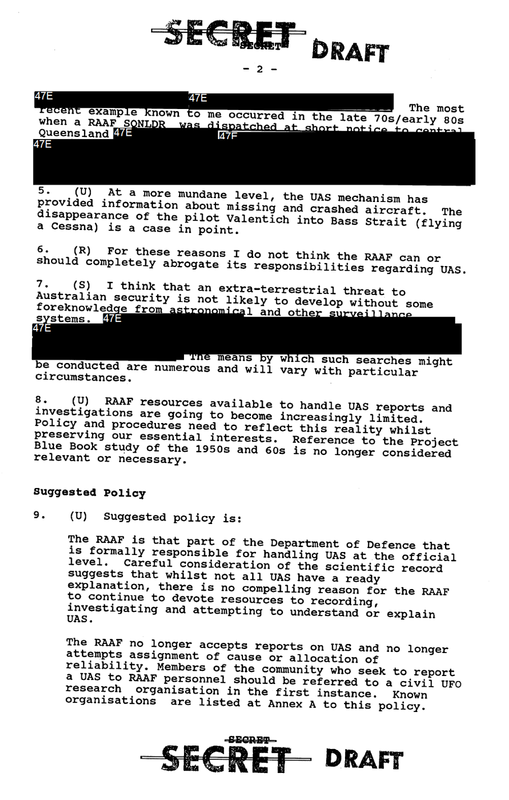 Consideration of the scientific record suggests that, whilst not all UAS have a ready explanation, there is no compelling reason for the RAAF to continue to devote resources to recording, investigating and attempting to explain UAS. I have always wondered about this “scientific record”? Likewise, I have often been puzzled why more isn’t known about this period of dying RAAF involvement with UAS. In November, 2013 I asked RAAF officer Group Captain Brett Biddington (ret) about this interesting period. The results of that short interview can be seen on Keith Basterfield’s blog site here. copies of any and all material that was created or used to draft this policy conclusion… …including any briefs; draft copies; memoranda; minutes of meetings; references to secondary material used in decision making processes; loose minutes; interagency correspondence; etc. Chris, Draft UAS policy + background info as discussed. Hope this helps as an interim measure. I sense no real problem exists in A block – minor changes only are expected, Regards…. Enclosed with this facsimile is Wg. Cdr. 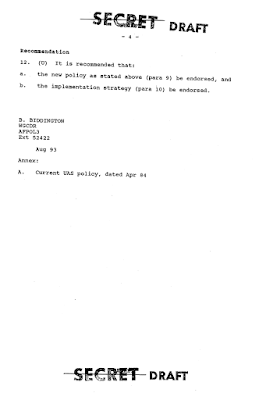 Biddington’s first, lengthy drafting of background information and suggestions which would soon morph into the minimalist 1994 UAS Policy. The first surprise is the security classification stamped top and bottom of every page. Traditionally, Australia’s Defence community assigned one of five levels of sensitivity to records: UNCLASSIFIED, CONFIDENTIAL, RESTRICTED, SECRET and TOP SECRET. The material presented here is stamped SECRET which is, despite what people think, actually very rare for Australian UFO records. And, as we shall see, some of this release still remains SECRET, or, rather, has been redacted, even now in 2015! Still, most of Wg. Cdr. Biddington’s efforts have been released. I will present each page, and focus on some quite notable highlights. It should be noted that each paragraph starts off with a letter indicating what security classification was assigned to that particular section. 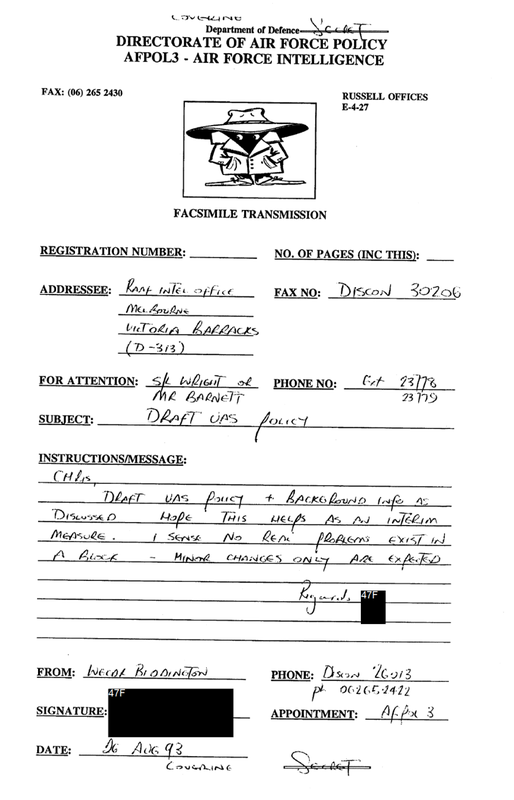 (U) indicates it is UNCLASSIFIED, (C) indicates CONFIDENTIAL, (R) indicates RESTRICTED and (S) indicates SECRET. 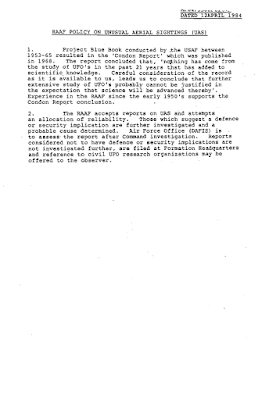 Page 1 begins with a paragraph of administrative and clerical text, which gives way to a more interesting second paragraph, which was formally classified CONFIDENTIAL (see above top). How fascinating. 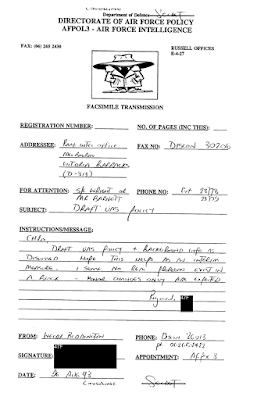 A full four lines of text are redacted. I will look at what the contents of this hidden material may be in due course. Continuing on, paragraphs 5 and 6, which mention the vanishing of pilot Frederick Valentich, raises a curious point about a logistical benefits of official study of UAS. 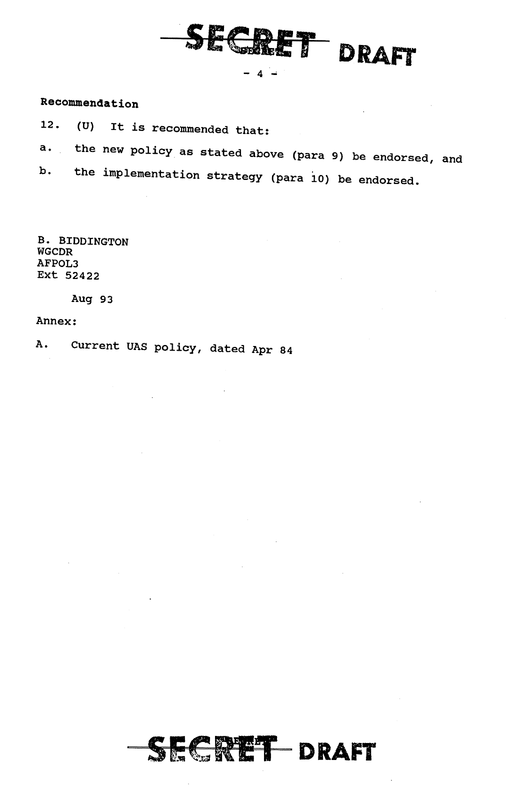 Note on the above last page there is also the listing of an annex titled “Current UAS policy, dated Arp 84” which of course refers to what was then the current UAS policy apparently in need of the complete overhaul that Biddington was prescribing. 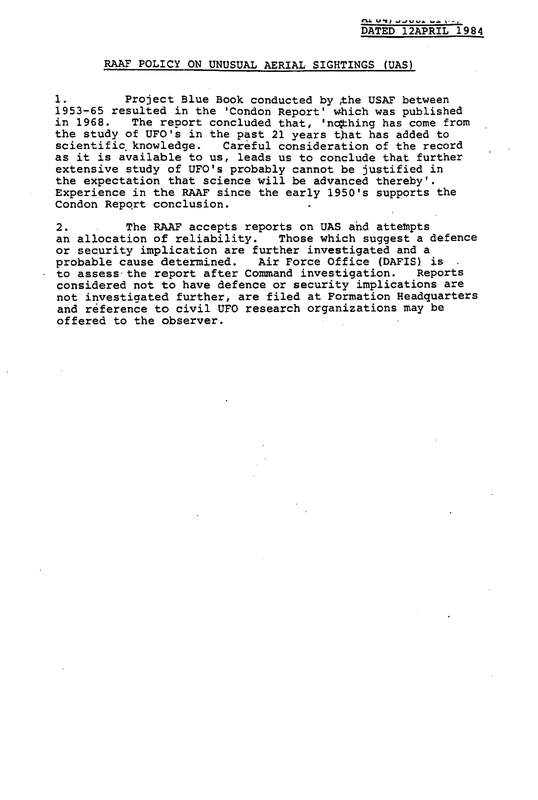 We’ve seen some of the 1984 UAS material, so I will discuss it only briefly, and further along. For now, what of the above material? The security classification level gave me degree of surprise, but I take the common sense angle: In any lengthy DOD publication, some paragraphs will be classified differently than others, and, indeed, the above material ranged from UNCLASSIFIED to SECRET. But, overall, the publication in its entirety has to be classified at the level of the highest classified paragraph. 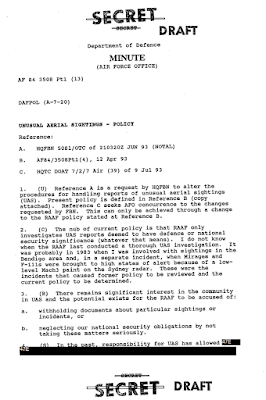 I have seen bulky US Air Force squadron histories classified SECRET merely because a few lines were classified at that level; but in reality the vast majority of the publication does not warrant this level of restriction. 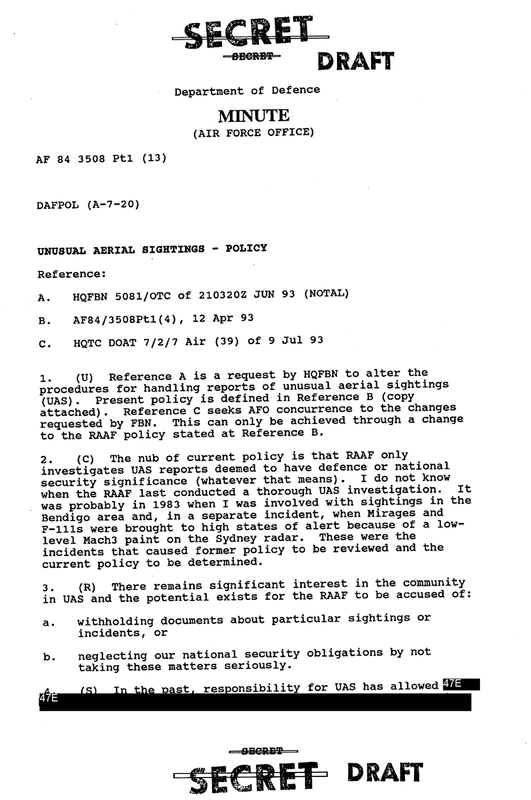 In the case of Brett Biddington’s draft UAS material, it is expected that any such Directorate of Air Force Policy, especially coming out of the Intelligence section, or “AFPOL3”, would have some sensitivities. That is, if we still lived in 1993…. …disclosure of the information under section 47E would prejudice Defence’s ability to obtain similar information in the future and would compromise the ability of the RAAF to complete its mandated role, namely defending Australia and its national interests from the air. 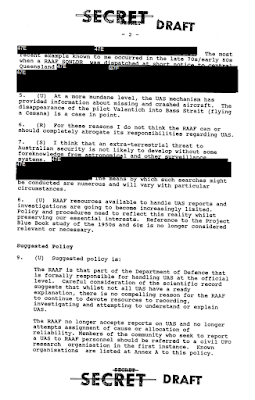 GPCAPT Wallis is satisfied that the expected effect of disclosing to you material identified exempt under section 47E(d) could have a substantial adverse effect on the proper and efficient conduct of the operations of Defence, in that once the information was made publically available it could divulge areas of capability interest. So what do we think they may say under that black ink? This tells me that the RAAF has been able to use civilian UAS reporting to find, or attempt to find, manmade space junk that has re-entered and crash landed – something absolutely inevitable in a nation large as Australia. Various US Air Force collection memoranda and policy justifications have stated that downed space junk, especially of Soviet or otherwise Eastern Bloc origins are of considerable value. A November, 1961 USAF HQ Intelligence memoranda laid out that crashed space junk was considered “items of great technical intelligence interest” and that some of the duties of specialised intelligence teams were to “expeditiously retrieve downed Soviet Bloc equipment”. The text in our Biddington draft document mentions a RAAF officer having to dispatch to central Queensland, and I presume it is regarding one of the numerous instances when spherical cryogenic fuel containers came down there. There is a possibility the redacted text is referring to something more exciting, like an incident we have no idea about, or an especially large or technically noteworthy piece of space hardware. 7. (S) I think that an extra-terrestrial threat to Australian security is not likely to develop without some foreknowledge from astronomical and other surveillance systems. X X X X X X X X X X X X X X X X X X X X X X X X X X X X X X X X X X X X X X X X X X X X X X X X X X X X X X X X X X X X X X X X X X X X X X X X X X X X X X X X X X X X X X X X X X X X X X X X X X X X X X X X X X X X X X The means by which such searches might be conducted are numerous and will vary with particular circumstances. I believe this may refer to Australia’s ability to engage in long-range surveillance – either simply atmospheric, or out into space. The RAAF’s Jindalee Over-the-Horizon Radar Network (JORN) was, at the time of this policy change, being developed and, interestingly, Brett Biddington was involved in the implementation of the huge JORN program. It is quite possible that the above redacted material relates to detection of unearthly craft, on the very off chance they should come! If not JORN, then maybe the blacked-out text refers to Australia’s use of US space tracking systems? Or novel height finding radars quietly in use by our armed forces? 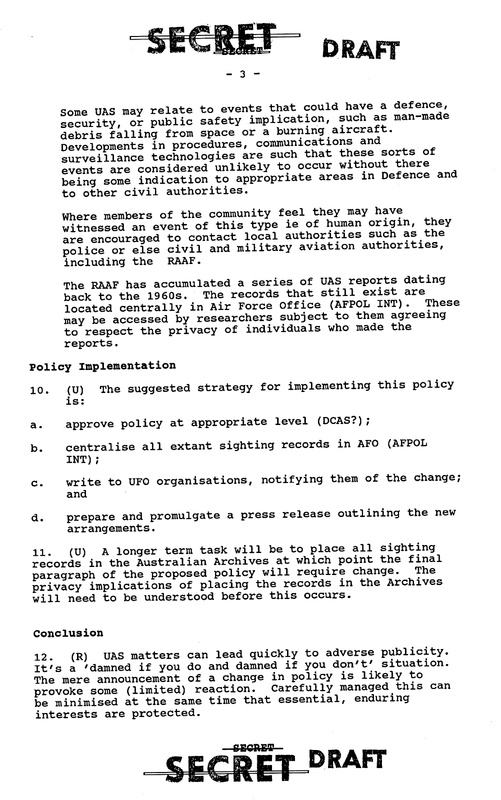 Suppression of UFO visitation reports are definitely government policy. Beyond this Australian information we can be sure even more 'secret' information has been withheld. Top level authorities are, I am sure, privy to even more direct experience.